As part of its resurfacing program the Streets Department has added completed new bike lanes on Berks St from 7th St to the Berks Market Frankford El Station on Front Street in Fishtown/Kensington. 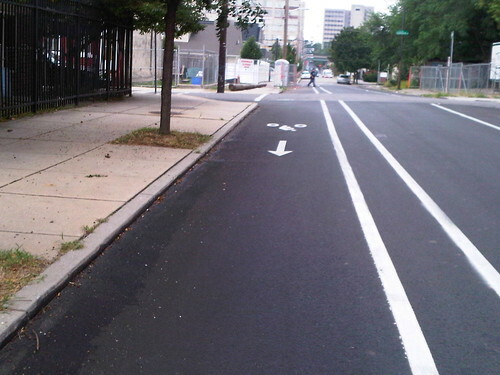 Plans are to complete the eastbound bike lane all the way to Temple University. The one way section of Berks features a narrow buffer to the bike lane. 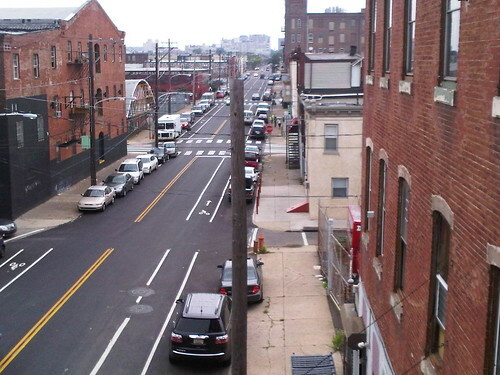 View of the bike lanes from the Berks Station platform. Note the missing link with parking on the left side. There is an outdated "sharrow" marked under those cars. Bike racks being used by commuters at the Berks El Station.